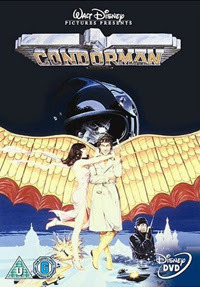 Condorman is a Disney children’s spy film. It does have one or two good set pieces, but on the whole it’s a pretty sloppy affair. The film opens in Paris. Woody Wilkins, a comic book writer is testing a plot point in his latest Condorman comic. In the comic Condorman leaps off the Eiffel tower with a set of wings that expand out from a pack mounted on his back. So naturally, that’s where we find Woody – dressed as Condorman and leaping off the tower. Down below, taking photos is Woody’s friend Harry Oslo (James Hampton). Woody or Condorman if you prefer, is played by Michael Crawford, who these days is better known for being The Phantom Of The Opera in London. But back then, he was better known as the accident prone Frank Spencer from the television show Some Mothers Do Ave Em. In an attempt to bury the ghost of Frank Spencer, Crawford adopts a very strange American midwest twang when speaking. It is very disconcerting. But back to the action. Woody’s attempt at flying doesn’t go too well and he ends up in the river. Harry tries to console him. Who is Harry? Harry is an old friend who happens to work for the CIA – but before you go thinking that this guys is a daring secret agent – I hate to tell you that he is just a file clerk. But all that is about to change. Harry’s boss, Russ (Dana Elcar) takes off for a couple of days to Geneva. During his absence, Harry is promoted to looking after the French section. One of his tasks is to take care of an document exchange with the Russians. Both parties have agreed that the exchange should be performed by civilians. It is Harry’s job to pick the civilian. And as you would have guessed, Harry turns to Woody. Woody, who has a tendency to live in a fantasy world, jumps at the opportunity. He turns up at the train station wearing an old fashioned trenchcoat and hat. Harry chains a briefcase to Woody’s wrist and sends him on his way to Istanbul. Waiting at the other end in a restaurant is Natalia (Barbara Carrera). The document exchange is supposed to be a civilian opperation, but Woody tells Natalia a few little white lies. He says that he is a top flight covert agent and he completes missions like this all the time. If Natalia was a civilian too, like she was supposed to be, then Woody’s lies would have been harmless. Instead she is a Russian agent, and she is being watched by some other unsavoury characters. A Chinese agent sets a pack of goons on Natalia, and Woody steps in to help. With dumb luck and clumsiness he takes care of the aggressors. Now everybody believes that Woody truly is a secret agent and all sorts of spy hijinks follows. The most interesting thing about this film is the cast. Crawford I’ve mentioned. Secondly we have Barbara Carrera as Natalia. It’s very strange to see her in a children’s film. At her best she is a femme fatale bombshell. But this film appears to be made just before she broke through with roles in I, The Jury, Never Say Never Again, and Lone Wolf McQuade. The other actor of note is Oliver Reed. He plays the role of the evil Russian spymaster, Krokov. I am very pleased to say that he doesn’t overact or do any unnecessary mugging, which so many actors seem to do when they are playing a villain in a kid’s film. Reed plays it cold and scary. Condorman is a bit of a throwback to when children’s films were lowest common denominator film-making. These day’s children’s films are much more sophisticated. This film falls into the trap of going for the cheap laugh, rather than allowing and trusting the audience to understand and enjoy the story that they are telling. To the film’s credit though, it does feature a fare amount of Cold War style espionage, which is only tarnished by these switches into comedy. In the end it’s pretty hard to be critical of a film called Condorman, which features a man dressed in a bird suit on the posters and DVD cover. Let’s face it, it is aimed at kids.